We rarely do theme roundups on ThematoSoup (this is a guest post by the guys from TemaplateMonster), but these WordPress themes may just be worth it. Give them a try and tell us what you think. Do you regularly do seasonal shopping? Most people want to look better and be in vogue when they finally shrug off their warm winter clothing. They strive to wear brighter colors and look younger and fresher. Fair enough? But what about your website? Don’t you think that it also deserves rebranding and refreshing? However, this will work only if you already have the one. Does your company still remain in the shade of competitors boasting their trendy online presentations? It’s time to wipe the smile off their faces and, finally, build your own website. Be assured, I will try to do everything I can to simplify the task for you. It’s not a secret that there are two ways to launch a website. You can hire a designer to make it from scratch or use a template. A custom design is great if you can afford it, of course. Don’t forget that the issues don’t end when your site is up and running. You will have to make regular updates (read investments) if you have no coding skills yourself. Yes, this way can prove costly, as they say. The second way is much quicker, simpler and cheaper. We are talking about building a website crafted on the basis of a quality template from reputable providers like TemplateMonster or Thematosoup. First of all you see what you get even before paying for it. So, no disappointments are waiting for you in the future. You save on themes as they, unlike custom designs, don’t cost thousands of dollars. Designed by pros, themes are easy to customize. Besides, in the process of customization you gradually acquire necessary skills for further website maintenance. Reputable web development companies always follow the latest web design trends and apply only advanced technologies. So, your website will look modern and be usable both for user and admin. Of course, this list could be continued, but what’s the sense? It’s much better to get practical help than just listen to how good something may be. 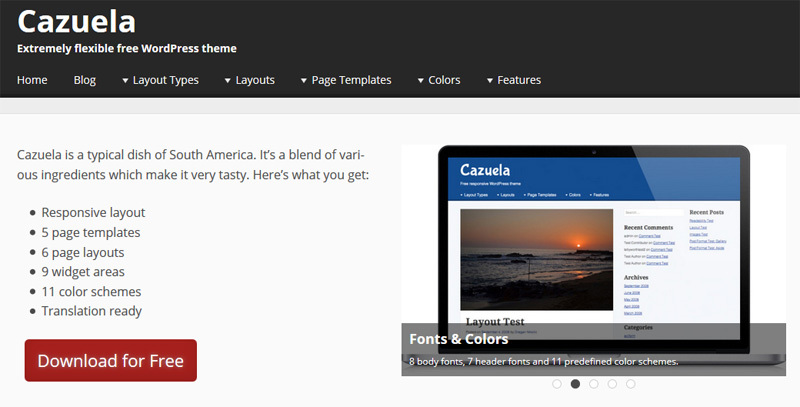 Below I have gathered 20 free WordPress themes. I don’t think that there is a point in explaining why we have chosen this CMS. Everybody knows that it’s popular, extremely user-friendly and customizable. Are you ready to experiment? Then, choose from the following list of the best and the newest themes. Photolab theme is designed in flat style and has a modern clean look. It is ideal for creating an engaging blog. The theme consists of a standard set of pages and is centered around the blog section. It’s accessible from the Blog page and the front page, which presents posts of various types (articles, quotations, photos, videos). Each type of blog content is separated in a block marked with a certain color bar with an icon on it. The responsive nature of the theme offers its viewers a pleasant experience on most handheld devices. This theme was designed for fashion agencies. It has been created in minimalist style. When one of the menu items is crossed, this means that you are on the relevant page at that moment. Brief information about the agency is below the model photos which open in a lightbox on being clicked. This responsive theme is good for business companies. HTML plus JS animation make its viewing more engaging. The theme is enhanced with Bootstrap and Cherry Framework functionality, so its customization won’t cause you any problems. All necessary documentation is delivered in a package with the theme. 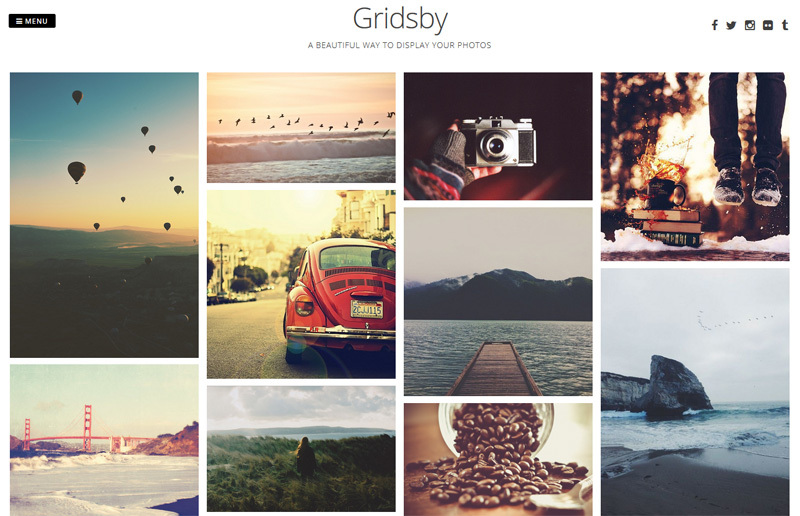 This theme will be suitable for a professional photographer’s portfolio site. It’s 100% responsive, so will look good on screens of any size. Audio player and video integration are also possible which will make your portfolio even more impressive. 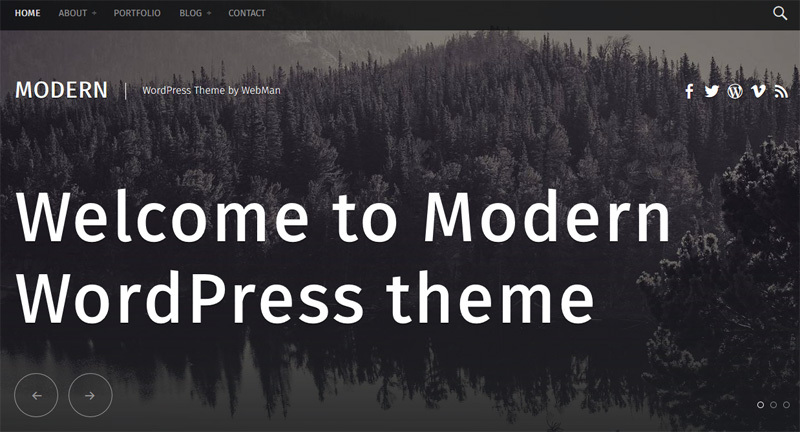 Modern is a responsive, retina-ready WP theme for blog or portfolio. It’s perfect for personal websites and small businesses. The theme supports Jetpack plugin, Schema.org markup, Theme Hook Alliance action hooks, translation-ready code, header slideshow and other cool features. It is compatible with Chrome, Safari, Opera, Firefox, Internet Explorer 9+ browsers. Here a screen-wide photo welcomes the visitors. Eleven predefined blocks are available to build your corporate home page. Each of the homepage blocks can have a parallax background image and its own set of colors. 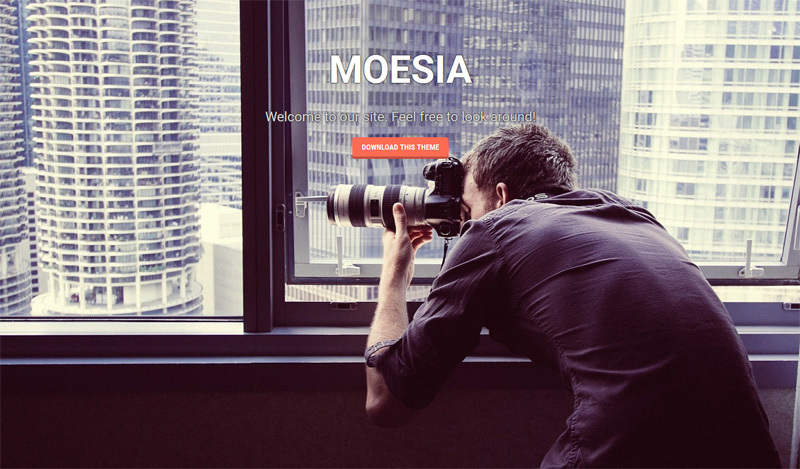 Get to know some more usable features of Moesia: a selection of Google Fonts, two types of layouts for the blog page, cool animations and effects and a parallax header to name just a few. Customizr WordPress theme can be used easily to create any type of website: business, blogs, portfolios, landing pages, forums, e-commerce sites, etc. 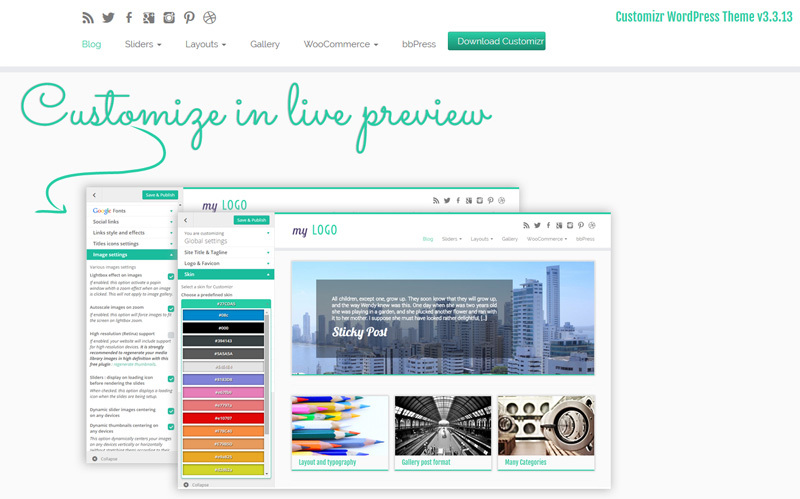 It has a set of live preview options, so technical skills to design and add content to your website are not required. The theme is responsive. It adapts to any type of device: desktops, tablets and smartphones and is compatible with all modern browsers. 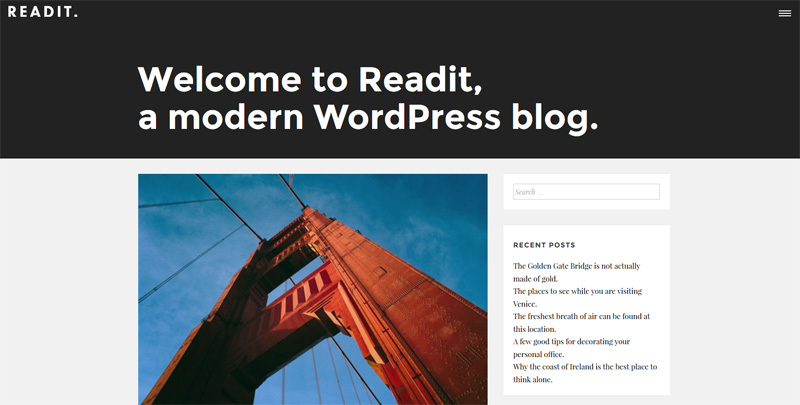 Serene is an airy blogging theme with post format support. The essence of this theme lies in the simplistic and spacious design. Browsing the theme is easy both for the eyes and for the mind because each new post appears like a breath of fresh air. Make is a smart, simple, and incredibly powerful drag and drop Page Builder at the core, specially designed to help you build the page layouts you wish. All you need to do is click to add Columns, Banner, Gallery, Products, Posts List, or Downloads sections to your page. Mix and match sections. Configure layouts. Do all this without messing with a single line of code. 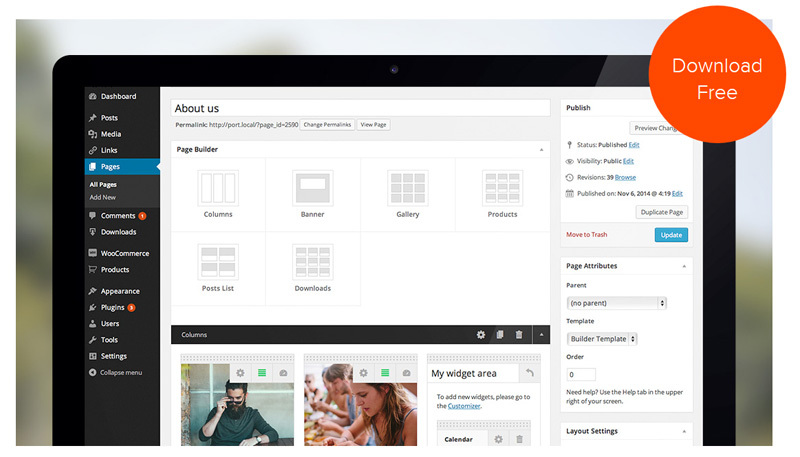 The Page Builder was developed to make you feel as though you are using a native WordPress dashboard. By the way, even Chris Lema’s (a famous WordPress advisor trusted by millions) site is built on the basis of this theme. This fast, lightweight, mobile responsive WordPress theme has been built with speed, SEO and usability in mind. GeneratePress is mobile responsive, W3C Markup Validated, Schema.org microdata integrated, search engine friendly, cross browser compatible (including IE8+), WooCommerce compatible, BuddyPress compatible and 100% translatable. It has 8 widget areas, 5 navigation positions, 5 sidebar layouts and much more. GeneratePress is translated into English, German, Portuguese, Spanish, Russian, French, Norwegian, Polish and Czech. Mustang theme is very easy to use. 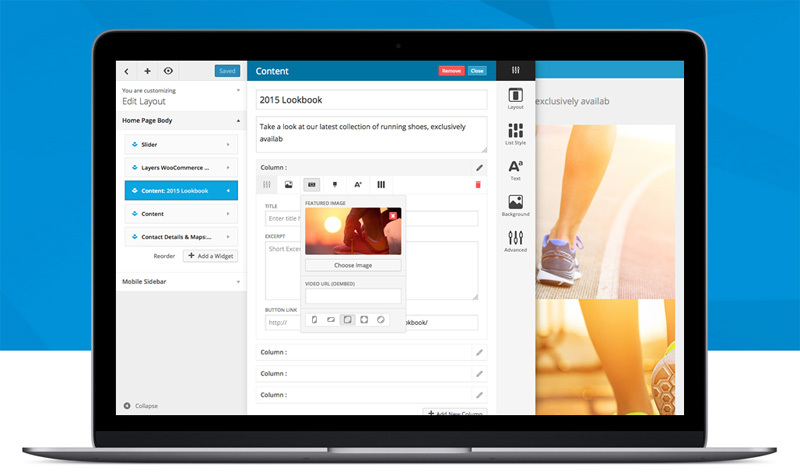 It offers support for drag & drop Visual Composer page builder even in its free Lite version. Polygons in the background and Parallax scroll make the layout trendy. Nice hover effects breathe life into it. This responsive, free and simple theme uses only native WordPress functionality, so it’s light, stable and future proof. Your blog or business website will be up and running within minutes. All settings are gathered in one place and easily accessible via Theme Customizer. Main theme’s features are: responsiveness, two layout types (boxed and full width), 11 color schemes, 8 body fonts and 7 heading fonts, four page templates – widgetized homepage, masonry, authors & sitemap, there are 3 main and 7 additional widget areas you can use in your website, child theming, and so on. 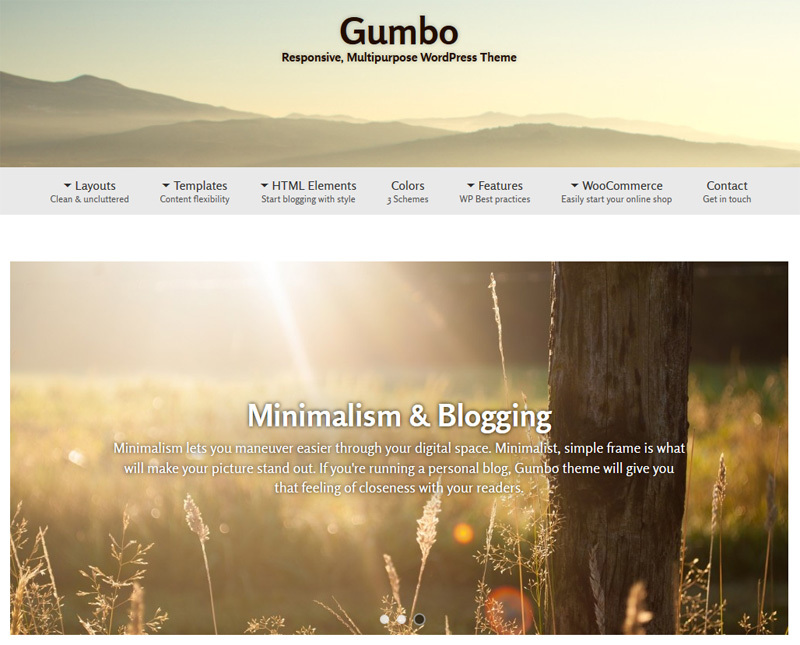 Gumbo is a multipurpose WordPress theme with clean minimalist layout. Due to the white space your content immediately attracts your visitor’s focus. Here are some of the theme’s main features: responsive & retina ready, WooCommerce Support, 4 page templates (Masonry), featured content, typography (15 fonts), translation ready, infinite scroll. 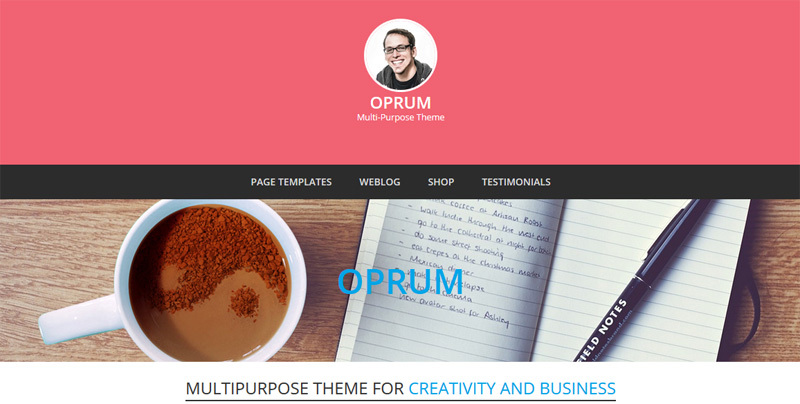 This free multipurpose WP theme not only has an appealing layout, but lots of usable features. It comes with standard page templates as well as the sample content and layouts. This will help you launch your site in no time. Every little thing can be changed right in the native WordPress theme customizer. Custom CSS panel is also included. BLDR is cross-browser compatible, has a built in color picker, comes with a selection of fonts from the Google library, included PSD files, sample content, is SEO-conscious and gets free updates forever. Want to create a popular blog? Consider this free theme. Here are some of its awesome features. Readit is provided with standard page templates as well as sample content and layouts. Change everything in the native WordPress theme customizer. CSS custom panel is also included. Plus many other cool features like cross-browser compatibility, unlimited colors, Google fonts, PSD files, sample content, SEO optimization and free updates. This modern theme is suitable for almost any type of business. It comes with a bundle of page templates and is compatible with WooCommerce. Customize everything via the WordPress theme customizer or CSS panel. Make use of unlimited colors, Google fonts, sample content and other standard features to create a really unique website. A fresh, modern way to display your photos in Pinterest style. Images open up in a full-screen overlay lightbox effect with social sharing. A hidden menu that slides out from the left sidebar and modest social media icons at the right top corner of the page don’t distract the visitor from viewing. Layers is a WordPress site builder. It’s so simple that you’ll feel yourself a pro even if you have no special skills. Layers is activated as a WordPress theme and works directly with the built-in WordPress Customizer. A code-free interface gives full control over the content and aesthetics of the site even to amateurs. Download Layers and plunge into the process of creation. You can make everything, from child themes to useful extensions, or just contribute to the core. This full-screen theme is suitable both for personal blogs and corporate websites. What makes this WordPress theme different? It stands out due to many reasons. I’ll name just a few of them. 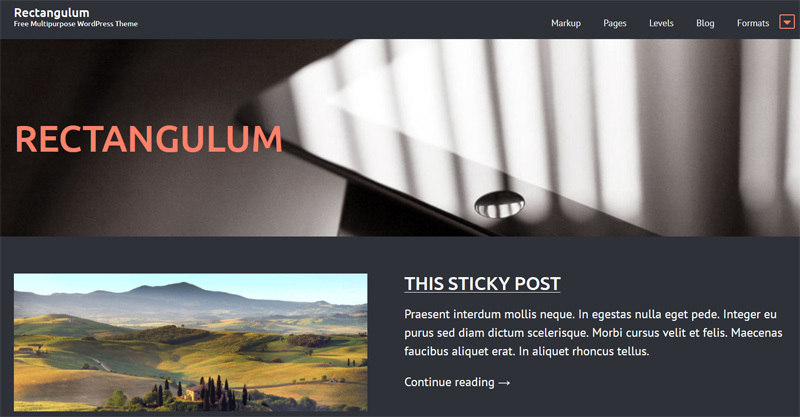 Rectangulum uses the built-in WordPress theme Customizer for simple theme customizations including custom logo upload, the color of all elements, homepage selection, footer text and more. Additionally, it has a slideshow responsive layout (FlexSlider v2.1) instead of the usual layout of tiles. This multi-purpose theme is responsive and is suitable for creativity and business projects. All settings are done via Live Theme Customizer. Not only is it ready for integration of WooCommerce and WooTestimonial plugins, but has custom widgets to display posts in video format, gallery, quote or aside in places like sidebars (sidebar or footer). The theme is ready to connect Jetpack WordPress. Turn on Infinite Scroll, Related Posts, Sharing, Tiled Galleries, Widget Visibility. Create custom menus just entering the link to your social media channels (All popular + Feeds FeedBurner) with social icon menu. Please note that this is not a full list of theme’s features. 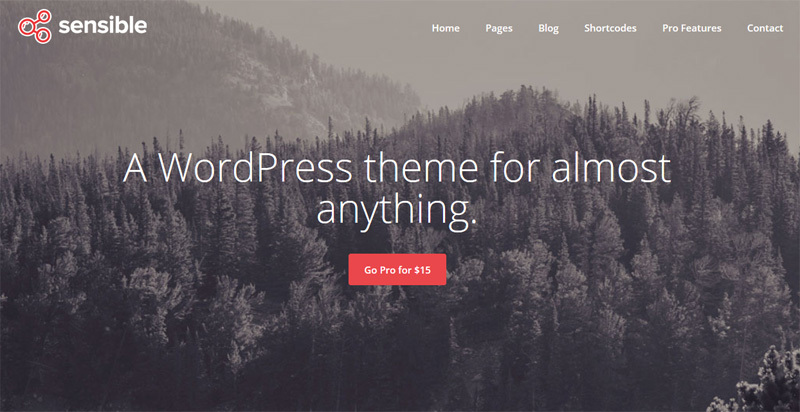 Our small parade of free WordPress themes has come to its end. I sincerely hope that you will find some of them good for rebranding and refreshing your website. Please let us know which of them you like the most and why. If you prefer paid themes or custom designs, share your reasons. I’m sure that the community is interested in your opinion. Speak up, your feedback is much appreciated. I'm one of the ardent members of the friendly copywriters’ society. I have a very curious nature and a long list of topics waiting to be featured. I constantly research in order not to miss a thing happening in the world of web design and development. Visit my Google account, I'll be happy to add you to my circles. Sensible theme is really cool. It’s a nice collection, thanks for sharing.